Product Reviews – Where Is My Spot? Like many of you, in various English classes through Junior and Senior High I had to keep a journal. For the first 5 minutes of class we each pulled out a cheap spiral notebook and wrote about…whatever. I’m sure the intent, when the assignment was first conceived, was a bit more focused than it was by the time I made my way into the classes. If the intent was to have us write about anything profound, or to make progress toward some useful writing, it was lost on me–especially the years where English was the first or second class of the day. No, my journals were often filled with musings (feel free to read that as whining) about how difficult it was to come up with something to write about in 5 minutes. My forced creativity occasionally led to my journal being filled with disconnected sentences, and wishes that I had enough time to focus on a fun topic. Nearly every time a teacher graded these I got unfocused comments that were about as close to a teacher calling a student a smartass as they could get away with. As I’ve gotten older, and continued writing for another 30 years, the process of coming up with something to write about hasn’t gotten any easier. I guess I’ve just always had a problem with unfocused inspiration. Give me a pen and a blank page and my mind starts ticking through possibilities–but instead of whittling them down to a select few, the topics multiply and multiply again until my writing paralysis starts to look like fear, rather than overload. I didn’t understand this all back then. In fact it took me a long time before I saw the pattern–as soon as a teacher told me what to write, I was off on a tear. Whether they gave me a narrow focus (an essay on a narrow topic) or a broad suggestion (write about aliens), the paralysis was over. This still holds true for me. When I need to write a story I feel so overwhelmed with all the potential stories I could write that I have trouble settling on one in time to get something on paper. But when someone says, “Write a story using one of these characters as your protagonist,” or “use this song as inspiration for your sci-fi story,” I can pick few key points and I’m off. Now, a little not-so-secret about me is that I like games. I spent years playing tabletop role-playing games, and even now my friends and I play quite a few party and strategy games. So, make something a game–and more importantly, tie in a set of custom dice–and you’ve got my attention. So when I came across these boxes in my local game store it wasn’t a difficult decision to fork over $7 to try it out. The concept here is not difficult. There are nine 6-sided dice, each side with a simple picture. You roll the dice and try to incorporate the nine pictures into something coherent. That’s if you play by the rules. But anyone who’s ever played Dungeons & Dragons–or even Risk–knows that everyone makes up their own rules. To me nine pictures seems fine for a game, but I’m not trying to see if I can link all the images; I’m just using them as a kickstart. So now, when the blank page has been mocking me for a few minutes I don’t hesitate to whip out my special dicebag, pick 2 – 5 dice at random, and see what comes up. This little writing tool is no cure-all. It doesn’t help me schedule time to write, it doesn’t help when my subconscious or ego gets in the way. But, when I’m ready to write, and can’t come up with anything, it’s amazingly useful. And it’s kind of fun, too. 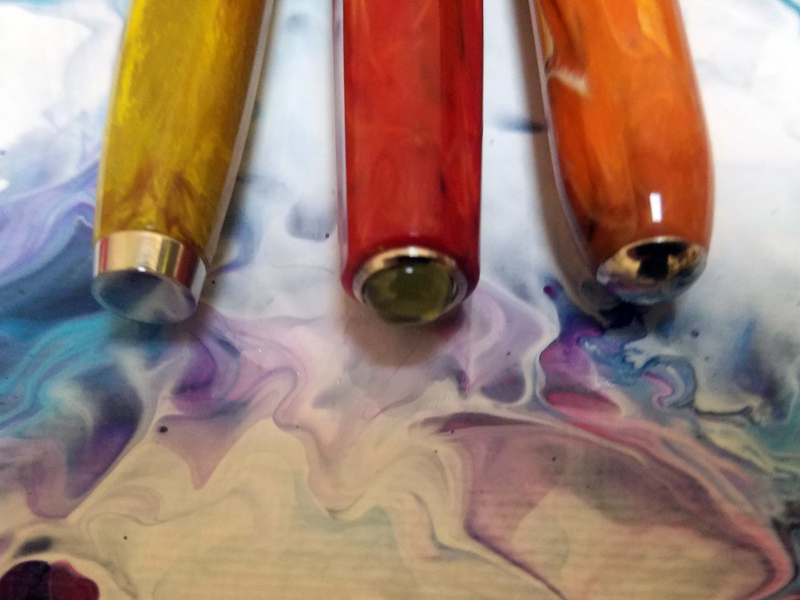 I love Franklin-Christoph pens–and I love the company, too. This is, in part, local pride as we’re both residents of North Carolina’s Research Triangle. However, I also love them because of all the companies I’ve seen, F-C seems to have a flair for experimentation and innovation. I’ve had several Franklin-Christoph pens over the past couple of years. Most have moved on to other owners as my tastes have changed. One exception to this was the Franklin-Christoph 02 Intrinsic Anderson Pens Special Edition (black body with bright pearlescent blue section and final). But when I saw the F-C 02 Emerald & Ice version I knew I wanted it in my collection. 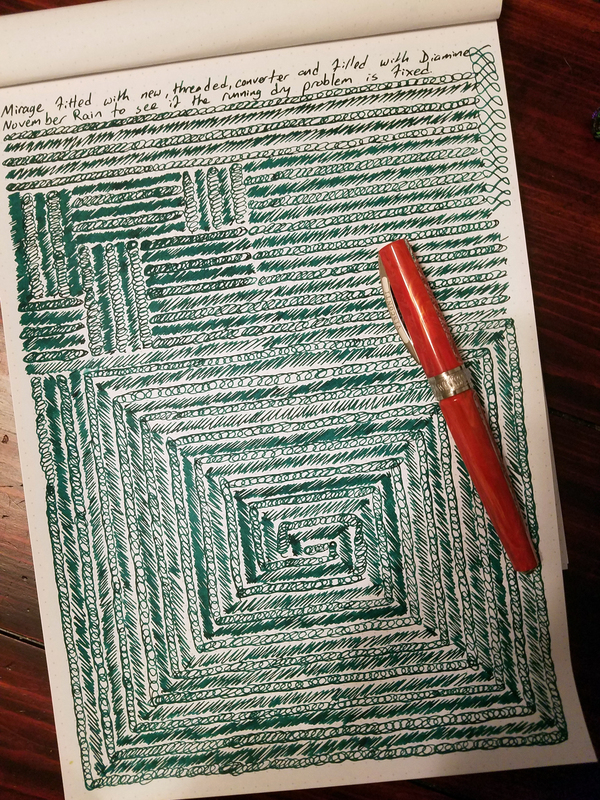 With one notable exception, I’m not the kind of person to have multiples of the same pen, so I sold my Anderson F-C 02, and bought the Emerald & Ice. I really think this pen is beautiful. And more importantly, the “ice” effect—done by applying some sort of texturing treatment to the interior of the cap and barrel—is something unique to my collection. The Emerald final—made of a slightly pearlescent darkish green material—provided a nice contrast to the Ice body. The pen tapers dramatically from the section, back toward the end, which results in a silhouette that is odd, but not unpleasant. I think I would have preferred if the section was also the Emerald material. I usually write unposted, and this would have given the pen body just a bit of flair. However, I know from reading reviews of the Smoke & Ice version many people suggested wanting the section to be clear—so it’s really sort of a personal preference. This is an uncommonly well-made pen. The shape was very well thought out—the taper ensures that the pen is only 3mm longer when posted than when capped. 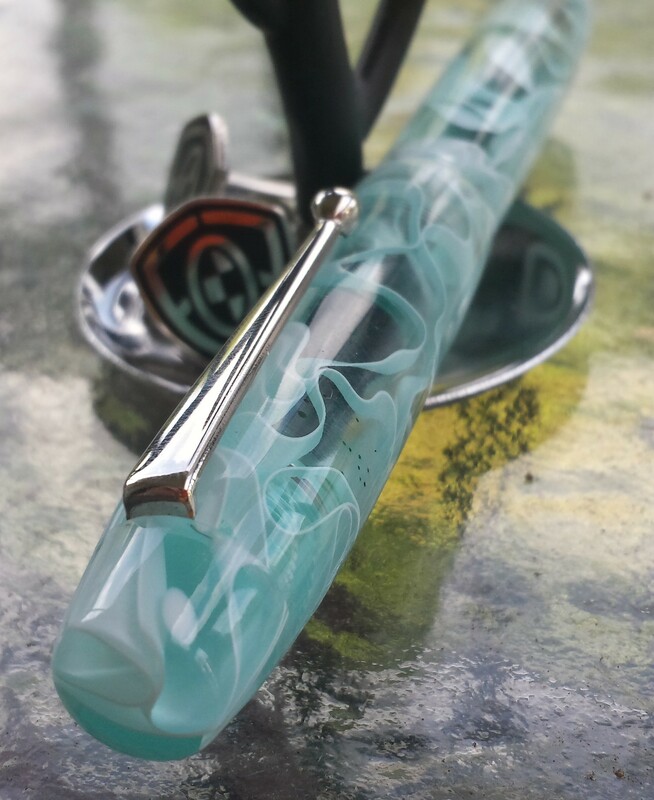 Where the Clear material is untreated—at the ends—the pen is crystal clear. A few reviews have mentioned that the clips feel flimsy, or cheap. I don’t know if I agree, but I also really don’t care about clips, as long as they keep the pen where it should be. The construction highlight of this pen is the threads that seal the pen to the cap. They are all the way down at the end of the section. Not only are they so forward that you won’t touch the threads unless you hold your pen uncommonly close to the nib. But even if you do, F-C used block threads so there are no sharp ridges. It’s a C/C. I like C/Cs. The threads are at the very end of the section, so they will get inky; but since they’re block threads they’re just as easy to wipe off as any smooth part of the pen. It’s also made to work as an eyedropper. In fact, as other reviews have touched on, the “ice” effect seems to be enhanced when using the pen as an eyedropper. But I hate eyedroppers. My hands are always a little warm, and no matter what I do I wind up with globs of ink on the page. So I’ll never get to see this pen in all its glory. I got the Steel Extra Fine nib. 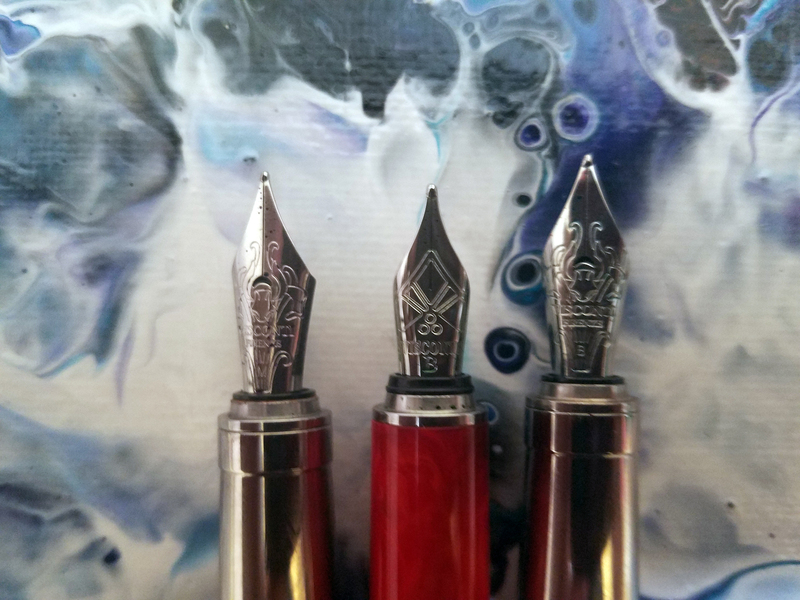 While there’s nothing special about the nib, it came in perfect condition. Smooth, and had obviously been tuned—wet but not too wet. No spring to it—at least not yet. IN the near future this one will be headed off to Art of Art’s Nibs for the Tomahawk treatment. This pen feels great in my hand—which I already knew from my previous experience with the F-C 02. Of all the F-C pens I have tried (02, 19, 25, 27, 29) this is my favorite. They’re all great writers but this one feels the best—it just fits my hand and my writing. What stops it from being a 10 is that the cap is not particularly secure when posted. After a couple of minutes of writing the cap loosens a little, and while it’s never fallen off it will loosen enough that it will rattle a little, until I either take it off the pen or re-secure it. 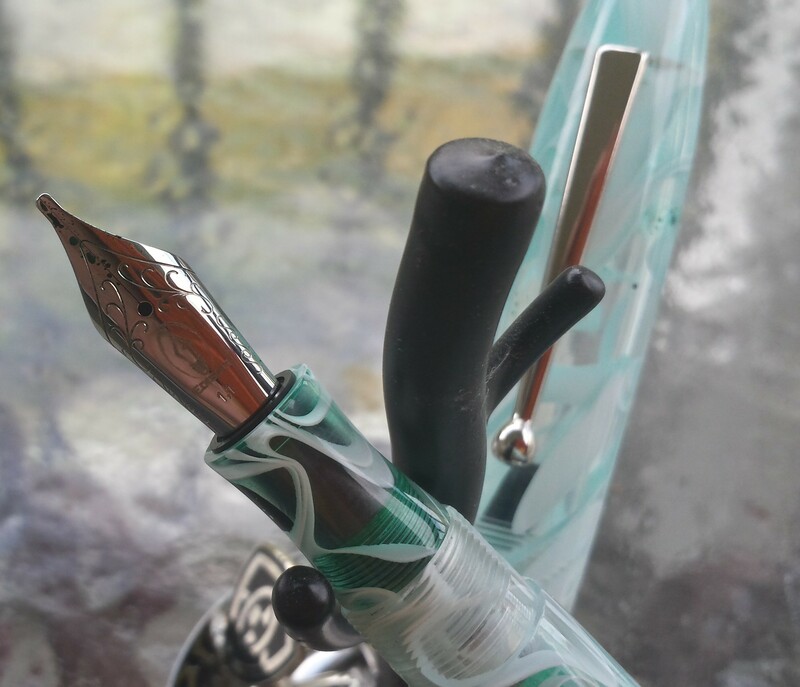 The Franklin-Christoph 02 Intrinsic Emerald & Ice. Beautiful, well-built and a great writer, it’s a great everyday pen. 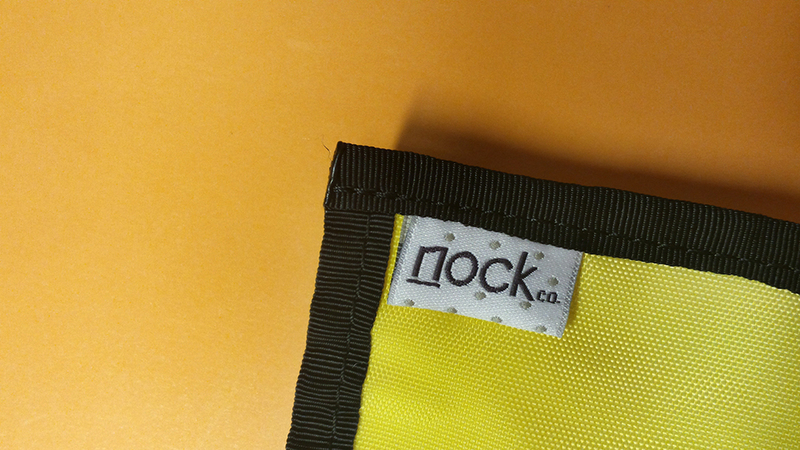 There are plenty of reviews of the various Nock Cases lurking around the web. This one will have a different focus. I’m going to take a look at the cases as a group. Think of it like a review of a collection of short stories instead of just a single story. I was a backer for Nock’s Kickstarter campaign. While others bought several cases, or even the whole lineup, I only signed up for a single Hightower case. Frankly I had concerns that the fabric they used would be too rough for pens with more delicate finishes. So I decided to try one, and see how I liked it. In the subsequent year+ I’ve had several of these cases come in and out of my possession (which should tell you how I felt about the fabric once I had it), I’ve had several low-level email exchanges with Brad (assuming he doesn’t have someone else answering his emails), and I’ve manually modified two of the cases. And I’ve carried the cases every day. In short, I’ve had enough interaction with the cases and the company to give a thorough review. To begin here’s a list of all the cases I’ve had. The ones in bold I still have. Brasstown, Forrest/Sunshine: This is the one I carry in my messenger bag when I go to work. It gets used maybe 2-3 days each week. 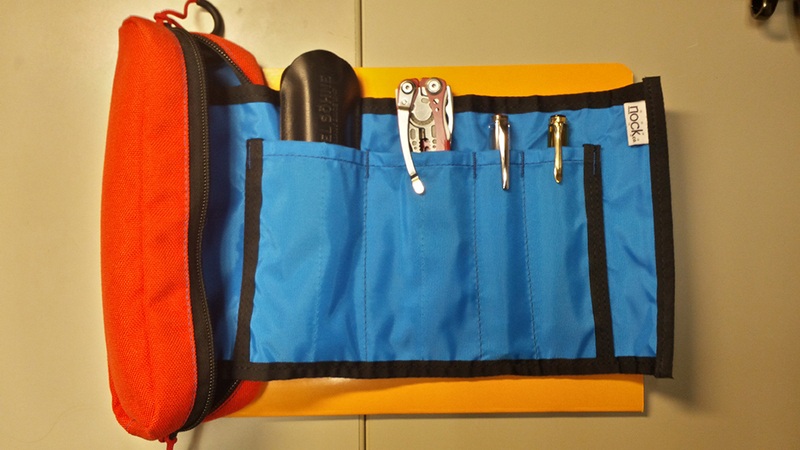 Brasstown, Mandarin/BlueJay, Modified: I’ve modified this one so that it holds larger items. At this point it’s sort of a catch-all for larger items (harmonicas, knives) if I’ll be carrying them around or packing them in luggage. Hightower, Steel/Mango: This one has two main uses. It’s my go-to case if I just need one or two pens and a small notebook, but I also use it to transport pens in my bag on the workdays that I don’t use the Brasstown. Hightower, Mandarin/BlueJay: Given away as a gift. Hightower, Steel/BlueJay: This was the one I got through the Kickstarter. I ripped out one of the bartacks to combine two pen slots into one larger slot. Unrelated to the modification the case got dropped in the parking lot and the oil wouldn’t come out. Sassafrass, Mandarin/Mango: Sent in error and returned to Nock…but I looked it over first. I liked the color combo so much I bought a new Lookout in this combo. Lookout, Mandarin/Mango: I use the Lookout when I’m going somewhere to write and I’m taking my Midori or large Rhodia pad. Fodderstack XL, Mandarin/BlueJay: The Fodderstack XL is my newest addition to the range, and I carry it around at work, loaded with a pen, a pocket notebook, and some index cards. The Nock Cases have a rugged, casual look about them. If you’re a style conscious person it might look out of place to pull one of these cases out of your suit pocket or leather briefcase, but they go along perfectly with backpacks and casual bags. That’s not a knock against them, but cases are chosen as much for their looks as how they protect your pens. And if you’re expecting a case that looks rich, you’re going to be disappointed. These are cases designed for EDC—after all, they’re named after mountains. 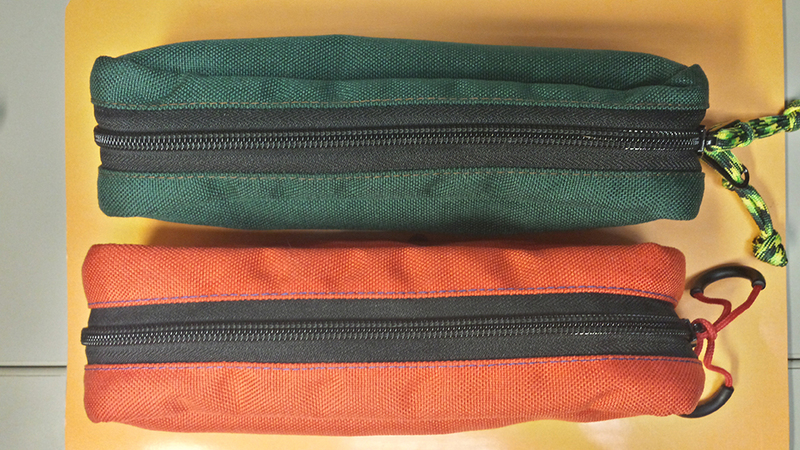 Each of the cases (except for a version that I have never owned) are made of two different grades of Nylon. The color combinations change from time to time—there are seven right now, and a few more have been phased out, or were used for limited runs. The interior colors are fairly bright—with one exception—while the exterior tend to be darker, but the Mandarin and Sky colors are fairly bright. Personally I think the color choices are nice. And while I understand why we can’t mix-and-match our own color combinations, it sure would be nice. In case Brad reads this…please make the new “Halftower” in a new Forrest/Mango combo. I’ve already said these cases are designed for EDC, so it’s no surprise that construction is where these cases shine. They are sewn with a variety of seams—exposed, hidden, reinforced, and bartack—and all of them are solid. I’ve now modified two cases by ripping out stitches, and ripping them out was no easy task. 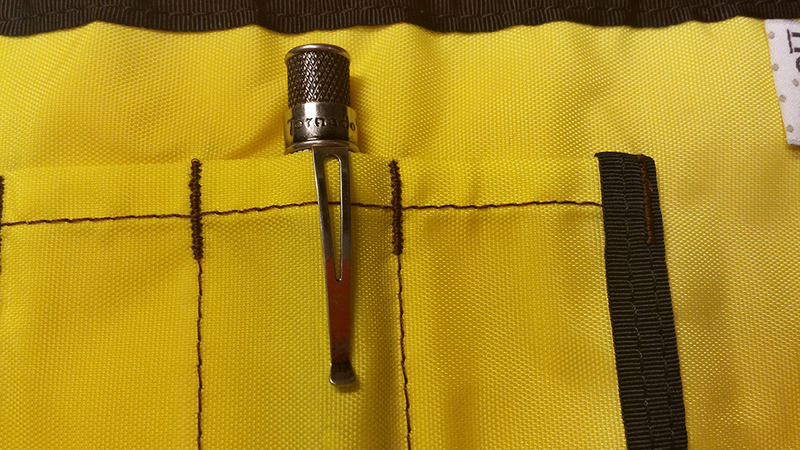 It took 5-10 minutes to get out a single seam to turn two pen slots into one. Errors in manufacturing aside if you blow a seam on one of these cases you’re doing something very, very wrong with your case. Looking inward from the seams, the two different grades of nylon are strong and even after a year of use don’t have any major wear. During the Kickstarter campaign I commented that I was skeptical that the nylon used would we be gentle enough on delicate pen finishes. 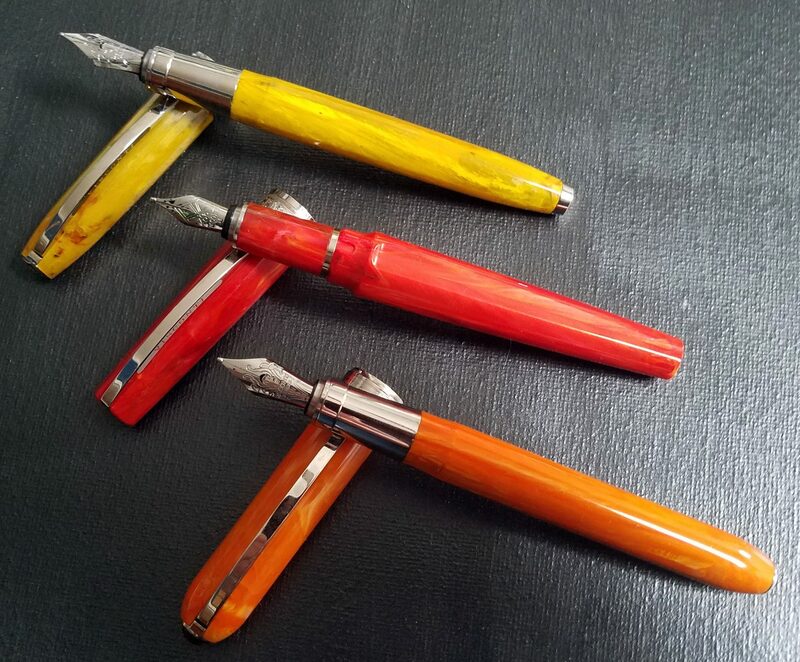 While I’m much less concerned, now that I have the cases and have used them for a year, if I had any ultra-high-end, ultra-glossy pens, I still might be a little wary whether the nylon (strong, not scratchy, but not what I’d call soft either) might not dull the finish over time—BUT, and I can’t stress this enough, I’ve not had the problem with any of pens, ranging from cheap to high-end. The advantages of selecting cases built to carry around, is that the materials aren’t expensive. Even taking that into account, these are a remarkable value. Prices ranging from $17 (Fodderstack XL) to $35 (Brasstown) are refreshingly low (note: there are two cases lower than $17, but I don’t have either of them). 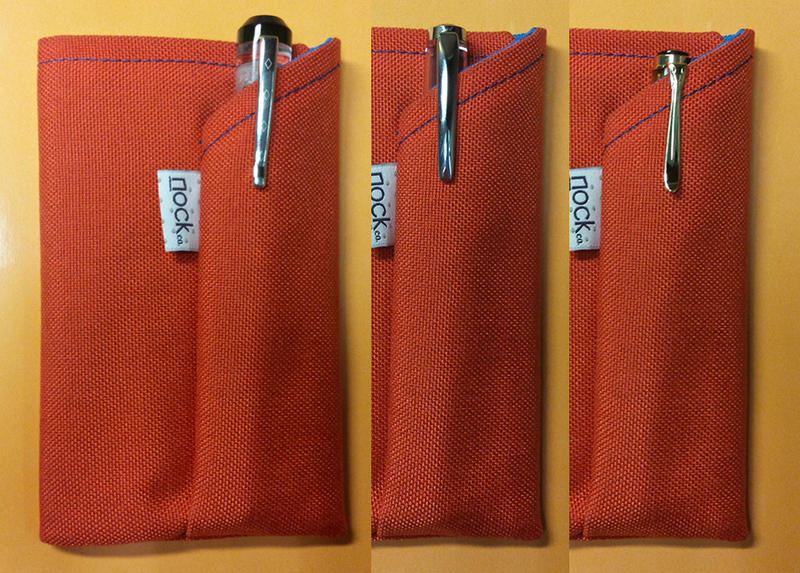 The Lookout offers secure protection for three pens, for anything short of crushing, for $20. In 2015 that’s a steal. One of the advantages of buying from a small company, be it a start-up or a maker’s shop, is the ability to connect with owner or employees of the company. When I decided that I wanted to modify one of the cases I asked Brad for advice, to make sure I didn’t ruin the case. I got an email back, the same day, telling me that other’s had made similar mods, and that I should have no trouble. He even asked me to let him know how it went. Likewise, when I’ve wanted a particular model in a particular combination he can generally give me a pretty good estimate when more will be posted to the site. All of my cases have come marked with the Made in USA label. I like this. Not for any nationalist pride, but because for this type of product it means that the work was done in one place—no wasteful shipping between manufacturing locations. It’s a few people working together to make a good product to fill a need. It’s the kind of business I’m happy to support. This is Nock’s largest case. Closed, it looks not unlike a traditional pencil case. But inside is a “tongue” that unrolls to reveal 6 pen slots. The tongue does not have a flap that folds down over the pens’ clips, but that’s a good thing. Not only would the flap make the rolled-up tongue much thicker, but it’s unnecessary, as the rollup will be tucked into the zipper pouch anyway. The roll-up is large enough that even holding 6 pens there’s still a little room left over for small bits and bobs. I keep small UV keychain light (for using Noodler’s Blue Ghost to send letters to my kids), a FitBit charger, a USB drive and some days even a harmonica in there to keep my pens company. It can be a bit large for everyday use, but it’s ideal for packing into a backpack, or into luggage for a trip. The one criticism I have—and I’ll freely admit this is a quibble—is the zipper. It’s noisy. If I don’t silence the zipper and put it in my backpack, I can hear the zippers rattle with each step. 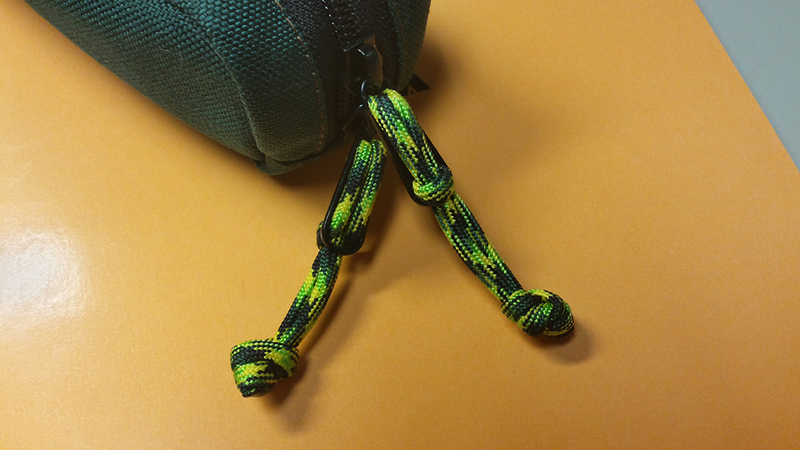 It’s not difficult to fix this; for one I cut off the zipper pulls and replace them with cord and rubber finger loops, for the other I wove cord through the zippers. Both of these solutions have the added benefit of allowing me to hand the case from a hook when needed. Ideally, this could be solved with using smaller zipper handles, rubberized zipper handles, or having a flap of fabric cover the zipper (like on the zippers of pants). I get that this would add a little to the price, and since it’s not hard to fix myself, this wouldn’t affect my use of this case. Like I said…it’s a quibble. A small nylon folio, the Hightower opens to reveal three pen slots inside the front cover, and one notebook slot inside the back cover. 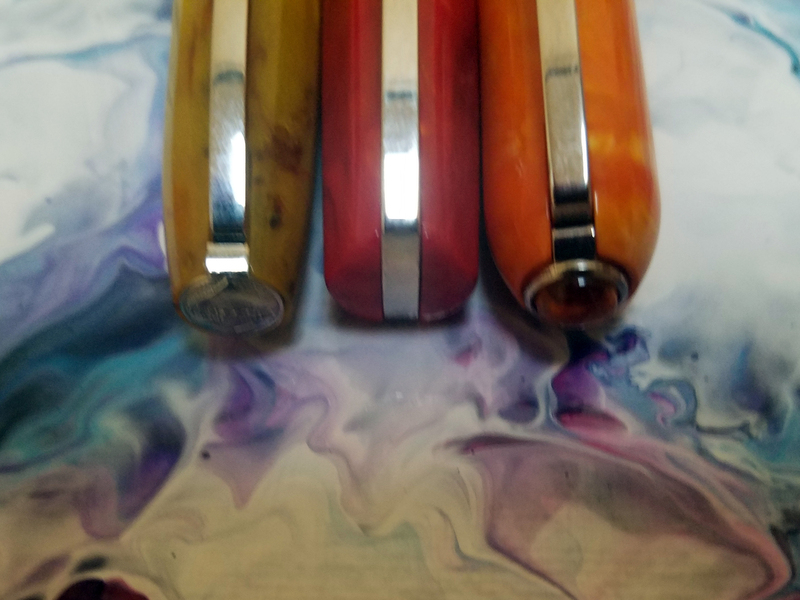 There is a flap that folds down to cover the pens clips, that serves to keep the pens from sliding out of the slots when the case is closed. I love taking this one along when I go out for the day, or over to a friend’s house for the evening. 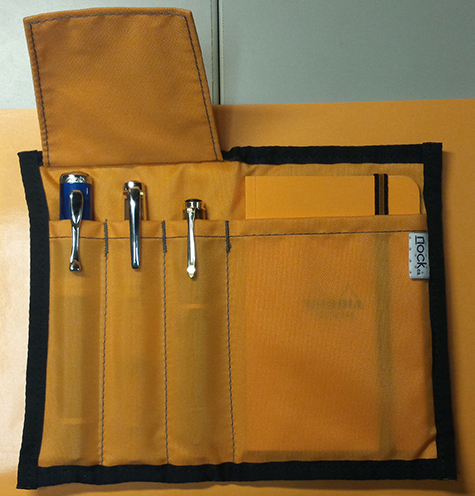 I love that it holds my preferred pocket notebook, the Rhodia Unlimited 9x14cm 60 sheets, with enough room left over for index cards or a few folded sheets of paper or receipts. In fact I can even get two of these notebooks into the Hightower, though it doesn’t close all that well. Drawbacks? Yes, one. If I put this is a bag, it sometimes works its way open. I’ve never had a pen fall out—thanks to that flap—but I have had a notebook fall out on occasion. Otherwise I just love this case. For me, this is the least versatile of all the cases. It only holds one thing—pens. Depending on the day this can be a plus or a minus. If I’m going somewhere to write, and I’m taking a larger format notebook, this case goes along perfectly—I can take three pens, or two and my ink pot. But if I’m not carrying a larger notebook with me, this one is just too limiting. 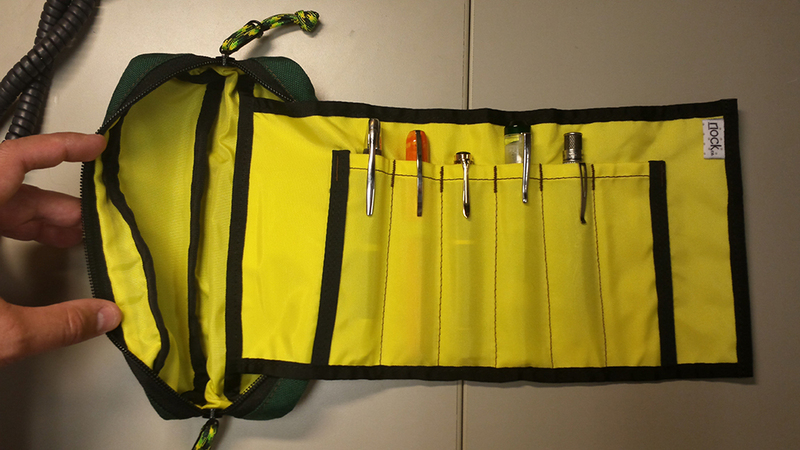 That said, if you’re packing your pens for later, the loop across the front of this case hold the pens very securely. If I toss one of these in my bag I know the pens aren’t going anywhere. I have frustrating relationship with the Fodderstack XL. For starters, it’s a ridiculously convenient case—holding one pen and one pocket notebook. If I just want to have somewhere to take notes or write down the stray thought, this case fits the bill. However, this is not a versatile case. If I want to use it I have to adjust to it—not vice versa. The problem is the very thing that makes it convenient—its size. 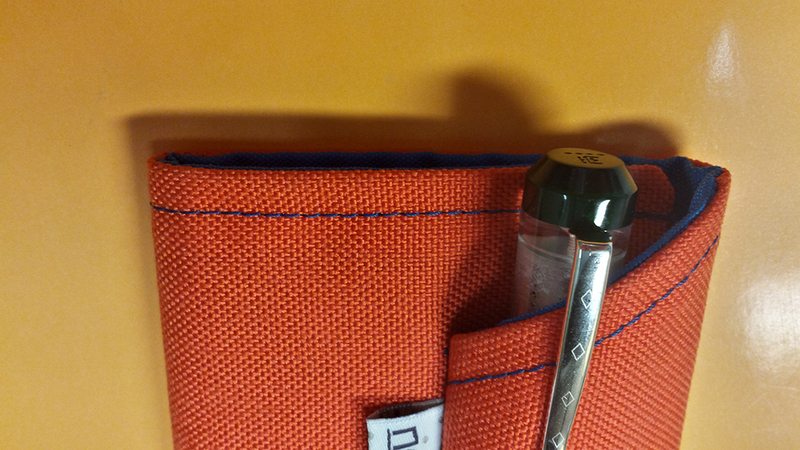 It was designed to hold the Nock pocket notebook (9x14cm), so it also holds the Field Notes books easily. However, it doesn’t like my beloved Rhodia notebooks (also 9x14cm) because they’re just a tiny bit thicker than the Nock notebooks. It also doesn’t like the Clairfontaine 9×14 notebooks. So it’s not like I can’t find something to fit in there, but it’s won’t take my Rhodia notebooks because the tolerances on the small case are just that tight. Similarly, using this case you need to be conscious of what pen you put in there. My favorite, lately, in the Franklin-Christoph 02—a fairly large pen—and it sticks up above the top of the case. So if I’m going to take this with me I can’t just toss it in my bag, but instead need to put it somewhere where the exposed end of the pen is protected. The TWSBI 580 is just a hair too long, but the Pelikan M200 is small so that one gets plenty of protection. 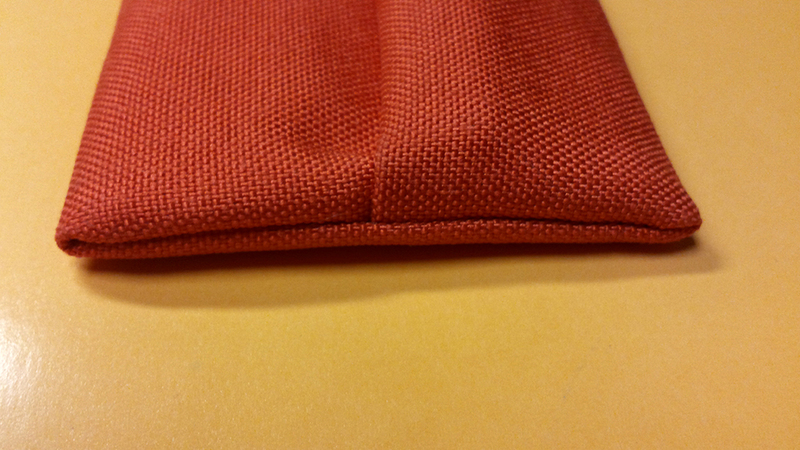 I love that if I’m going to a business meeting this case tucks nicely into my Suit’s lapel pocket. I get that these cases aren’t for everybody. 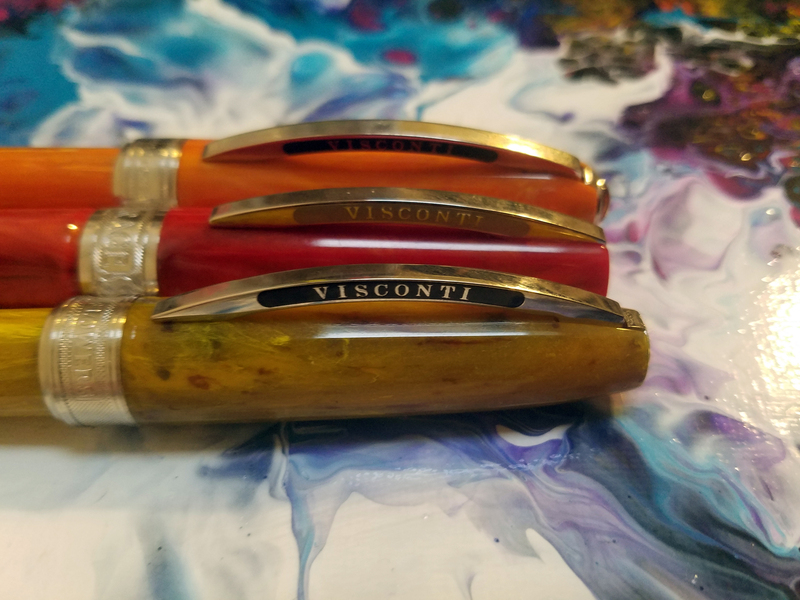 If you carry around twenty pens, these aren’t for you. Likewise, if you prefer cases made of leather or fancy materials, move along. But if you’re ok with the casual look and feel, these cases almost certainly have a good way for you to carry around a few pens. Whether it’s tossing your rollerballs and pencils in your backpack, or making sure you always have your favorite fountain pen at the ready, these cases are a good bet. I’ve seen some of the teaser pictures for the new “Halftower” case which combines featured of the Hightower and Brasstown cases. 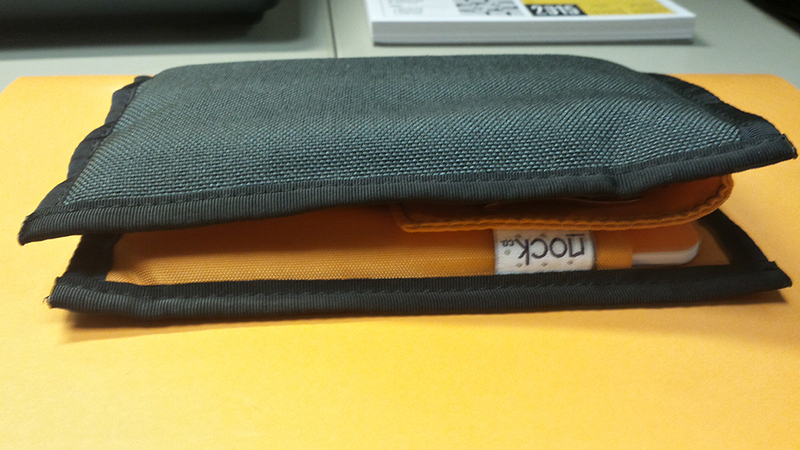 Additionally I’d love to see a case that holds an A5 notebook or pad along with one or two pens. But first and foremost I’d love to see a new color combination—fingers crossed for Forrest/Mango (if not that one, then Midnight/Sunshine).